Snapshot 14w04a Ready for Testing! Item frames can give off a signal detected by Comparators. Lots of changes to villager AI. Some of them now actually do stuff! Fixed most of the remaining issues with the /clone command, for example chest orientation. We have a new bug tracker website! Please report any and all bugs you find in Minecraft to bugs.mojang.com. If nobody reports a bug, we can’t fix it! [Bug MC-45071] – The world freezes if an Enderman is being hit. [Bug MC-45087] – Id for cooked fish is "minecraft:cooked_fished"
To get snapshots, open your launcher and press the “New Profile” button. Call it “snapshots” and check the box saying “Enable experimental development snapshots” and save. To switch to the normal version, you can select it in the dropdown at the bottom left corner of the launcher. Back up your world first or run the game on in a different folder (See the “new profile” dialog). Snapshots can corrupt your world. Sweet, gonna try it now! We must find all the secrets! Villagers? DOING STUFF?!? It's gonna be like we're playing a whole new game now! In all seriousness, though, really can't wait for this update. I love replacing all the stone in a chunk with air in the newest snapshot using /fill. Great for information about ore generation. Will the villagers do something useful?! That's something new! Time flies, but so does my pig. I hate when they add the 'secret' things, then you always want to test the snapshot to be the first one to find them. That's the fun about it. I wonder what sort of stuff people will do with the item frames? Forever protecting Hyrule with the power of the Master Sword! But why not the same for levers? :? Because you can already do that with levers. One thing I noticed is that you can't use relative coords with /particle, which is ridiculously annoying. I hope that's a bug or something that is changed in the next snapshot. The 1.8 update is looking awesomer by each snapshot. I like the villager AI changes, all the bug fixing and the /particle command. Now the question is: is "seecret" intentionally typoed or not? If you right click on the item in the item frame it will rotate and increase the amount of redstone signal coming out of the comparator!!! I am curious, where does all the crops go when villagers take them? 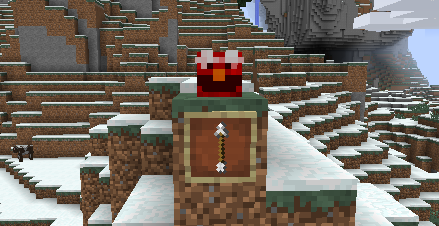 ... Also, i noticed the new changes to the slime block. I don't personally like them.